Review posted February 8, 2018. Arthur A. Levine Books (Scholastic), 2017. 64 pages. This book is the story of artist James Castle, told from the perspective of his nephew. James was born deaf and mute. Moving things seemed to frighten him, but he couldn’t even hear himself shriek. He eventually learned to draw, but he never did learn to speak, read, or write. When James got upset, he’d scream. His father started locking him up in the attic to calm down. Eventually, he spent so much time there, it became his room. He’d draw pictures of the furniture he wanted to have. When he no longer had access to drawing materials, he made his own from soot and spit. He drew on scraps of paper and even made books out of them. He continued to draw, and even made cut-out dolls, furniture, farm animals, and birds out of cardboard. James Castle’s art went unappreciated for most of his life, until his nephew showed some of his drawings to an art professor. The art professor arranged an exhibit, and later James got to see his work displayed in an art gallery. 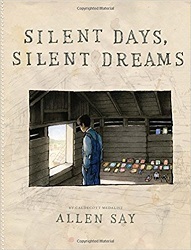 Allen Say does a beautiful job of telling about this artist’s life. He does most of the drawings in the style of James Castle and communicates how difficult life must have been for the artist – without any communication. In fact, he lets drawings tell much of the story. The drawings are especially poignant that show Jimmy shrieking when he couldn’t even hear himself, or being taunted by other children. But the story ends hopefully. When Jim’s sister got him a mobile home to work in, replacing the old chicken coop, his nephew heard him laugh for the first time. After thirty years in the chicken coop, Uncle Jim finally got his Dream House, as the family called it. He worked in it for fifteen more years, in the same way he had when I was a kid – drawing with soot and spit on scavenged paper. I think he was happy.